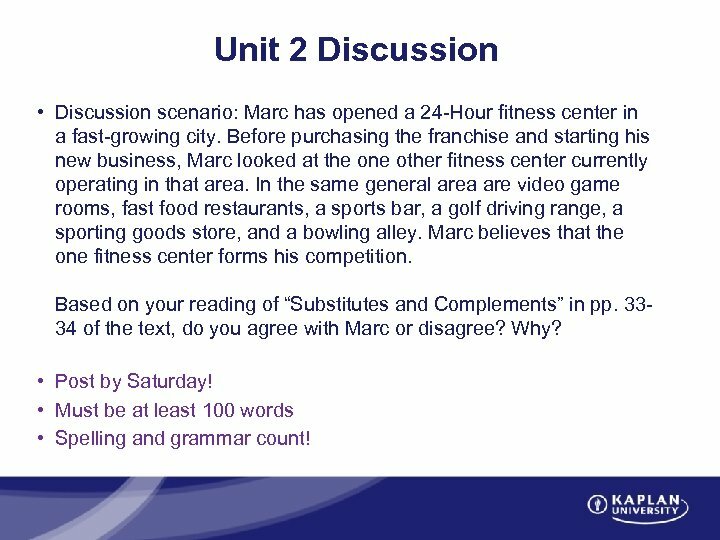 Unit 2 Discussion • Discussion scenario: Marc has opened a 24 -Hour fitness center in a fast-growing city. Before purchasing the franchise and starting his new business, Marc looked at the one other fitness center currently operating in that area. In the same general area are video game rooms, fast food restaurants, a sports bar, a golf driving range, a sporting goods store, and a bowling alley. 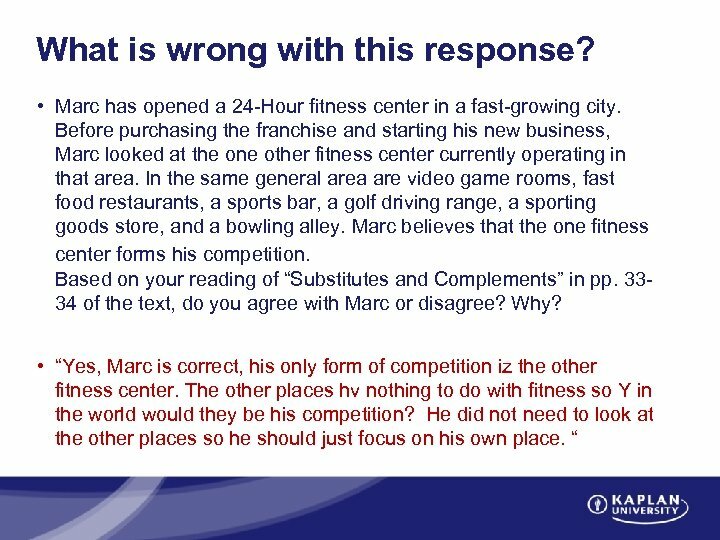 Marc believes that the one fitness center forms his competition. 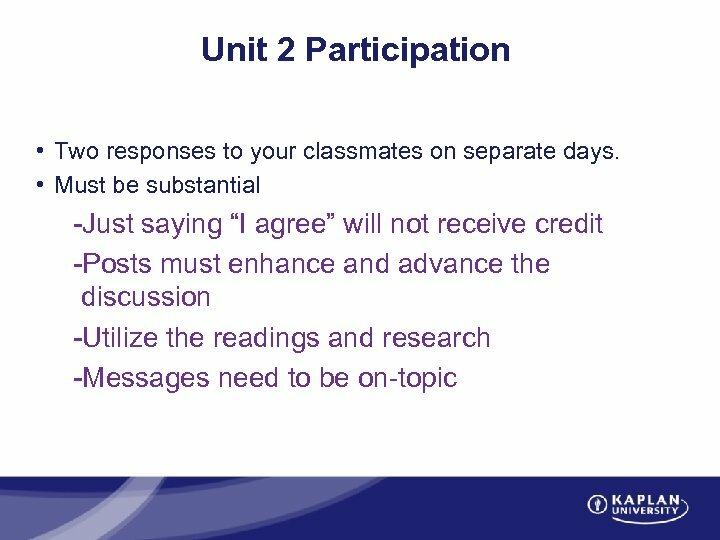 Based on your reading of “Substitutes and Complements” in pp. 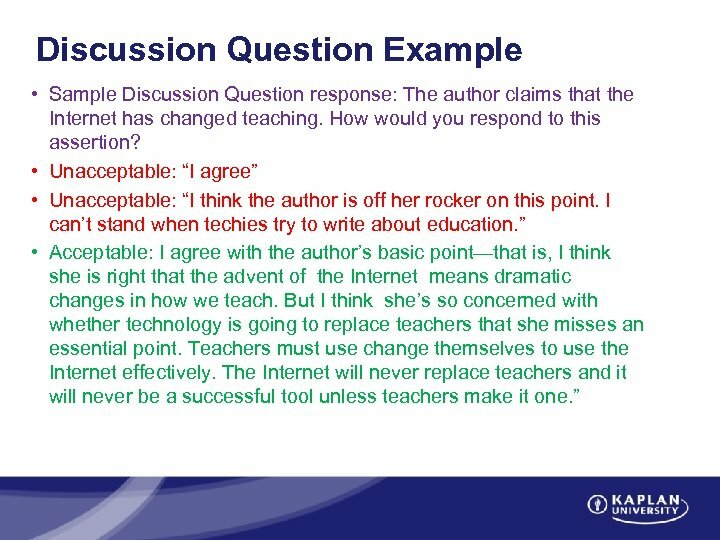 3334 of the text, do you agree with Marc or disagree? Why? • Post by Saturday! • Must be at least 100 words • Spelling and grammar count! 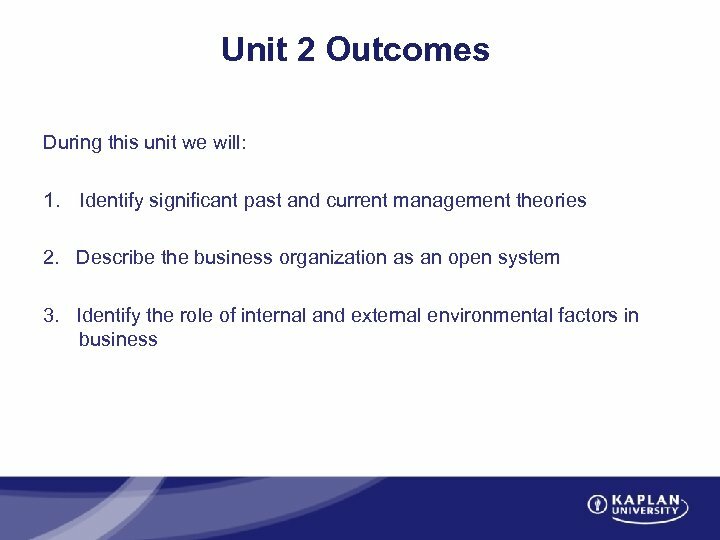 Unit 2 Assignment • For this assignment, you must watch the video presentation on the Evolution of Management. 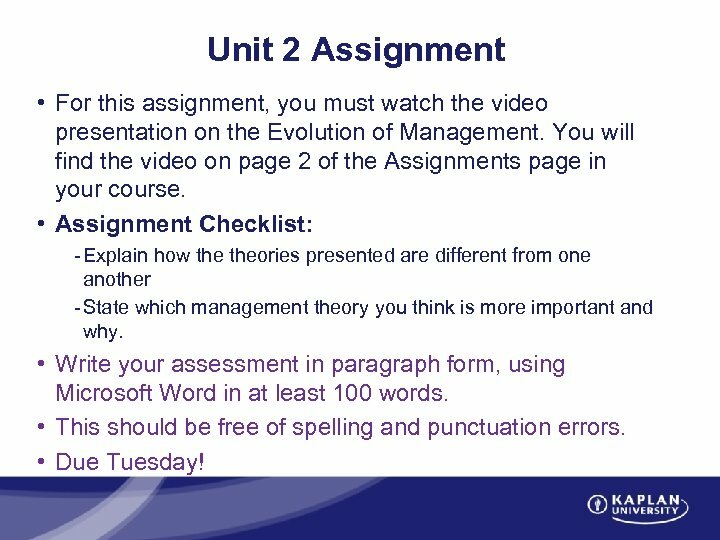 You will find the video on page 2 of the Assignments page in your course. 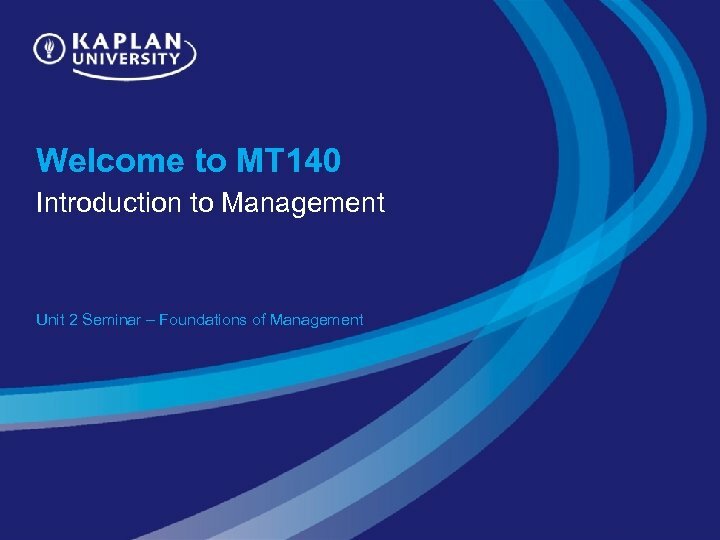 • Assignment Checklist: - Explain how theories presented are different from one another - State which management theory you think is more important and why. 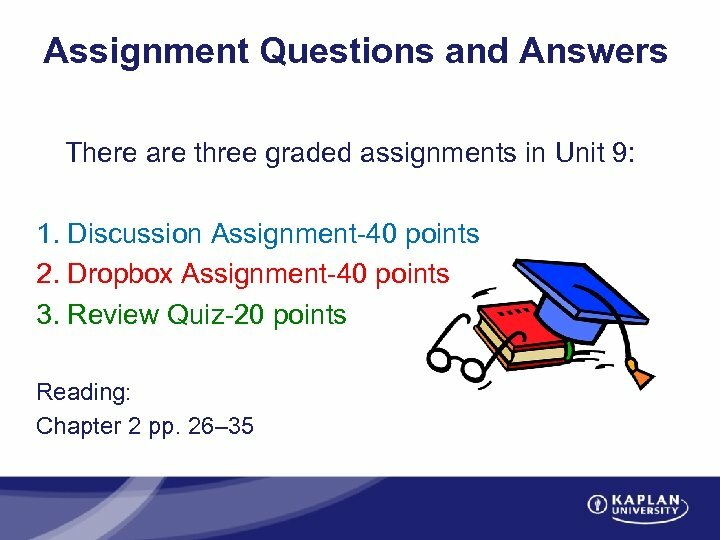 • Write your assessment in paragraph form, using Microsoft Word in at least 100 words. • This should be free of spelling and punctuation errors. • Due Tuesday! 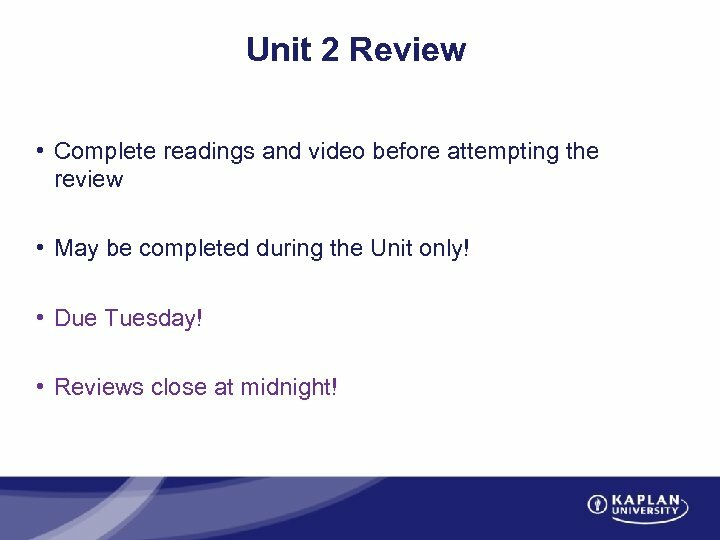 Unit 2 Review • Complete readings and video before attempting the review • May be completed during the Unit only! • Due Tuesday! • Reviews close at midnight! 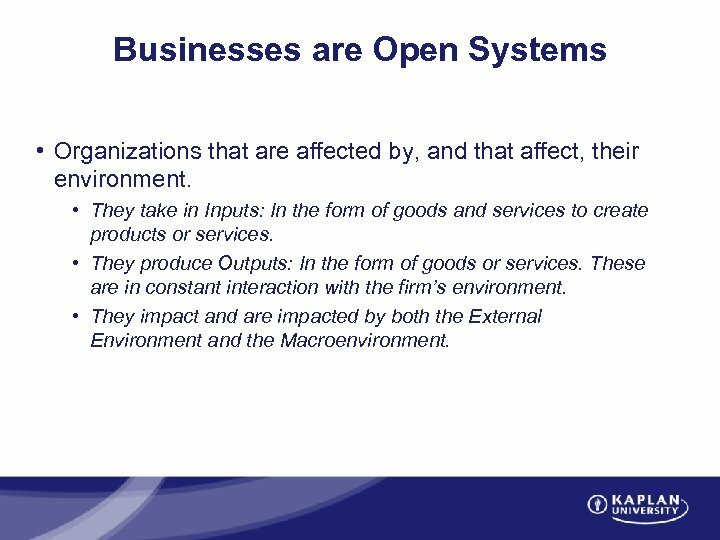 Businesses are Open Systems • Organizations that are affected by, and that affect, their environment. 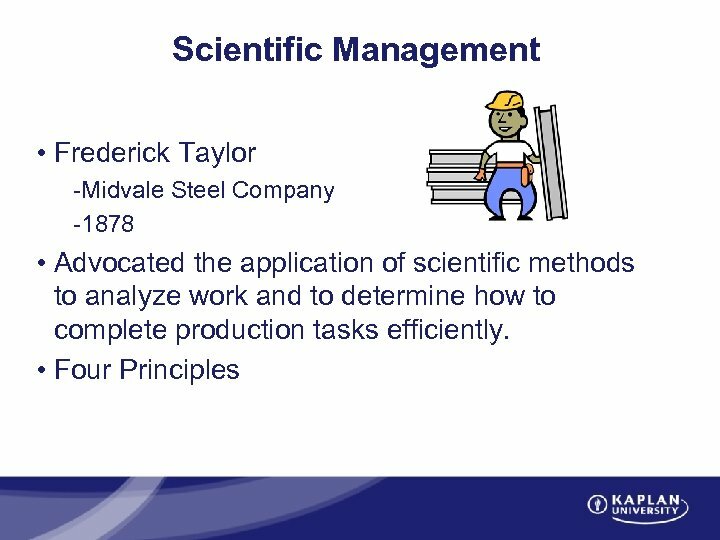 • They take in Inputs: In the form of goods and services to create products or services. 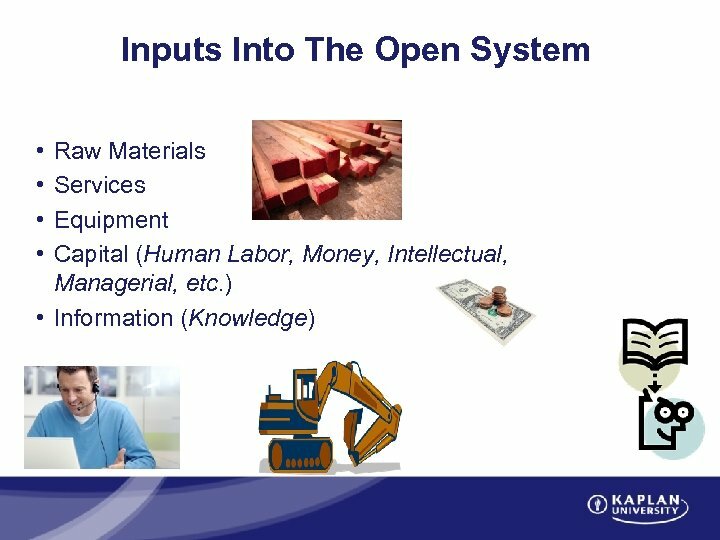 • They produce Outputs: In the form of goods or services. 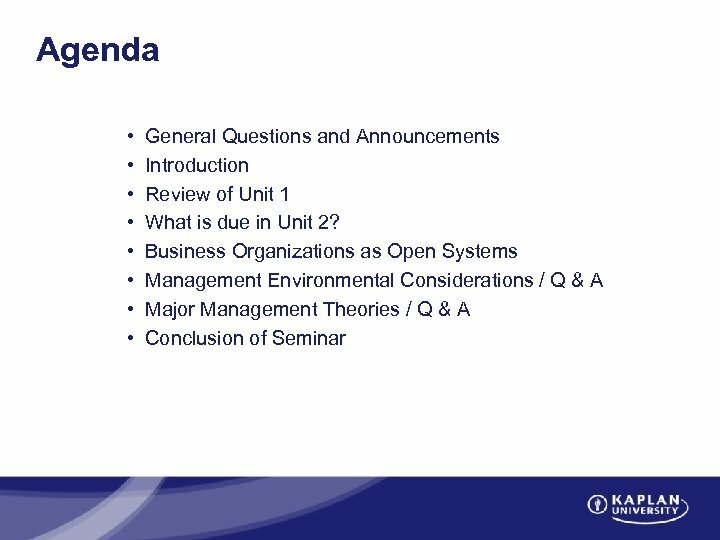 These are in constant interaction with the firm’s environment. 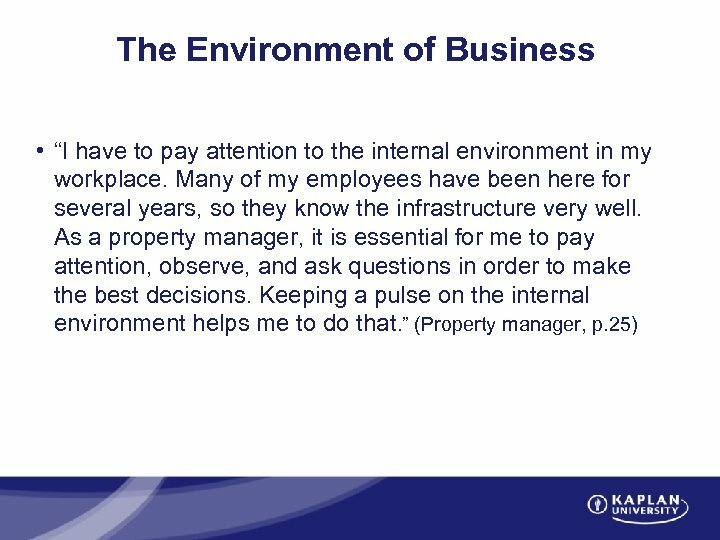 • They impact and are impacted by both the External Environment and the Macroenvironment. 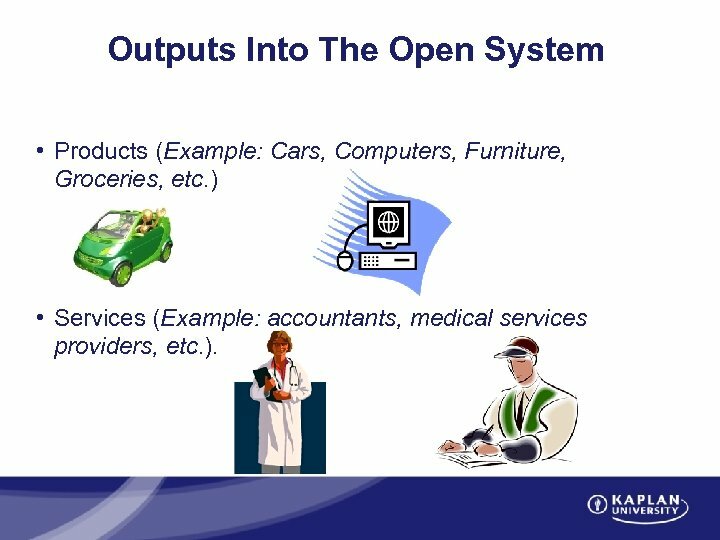 Outputs Into The Open System • Products (Example: Cars, Computers, Furniture, Groceries, etc. ) 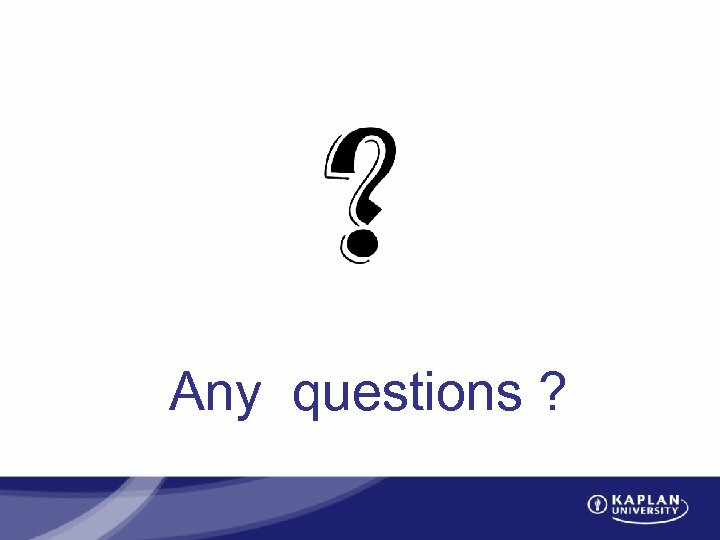 • Services (Example: accountants, medical services providers, etc. ). 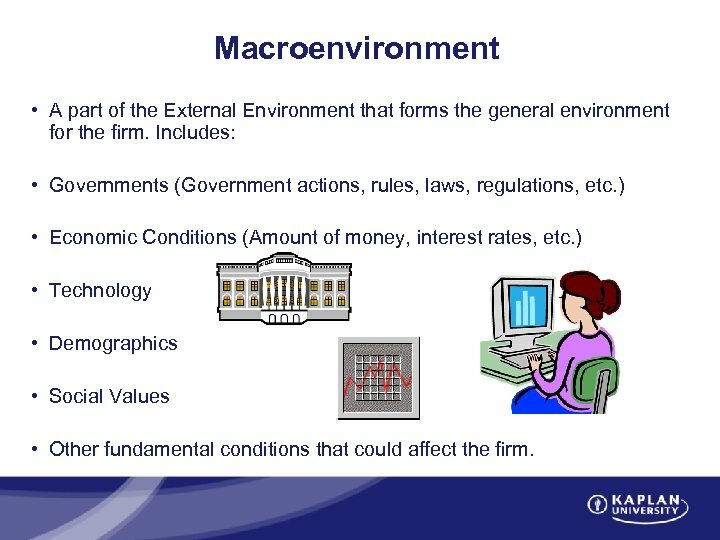 Macroenvironment • A part of the External Environment that forms the general environment for the firm. 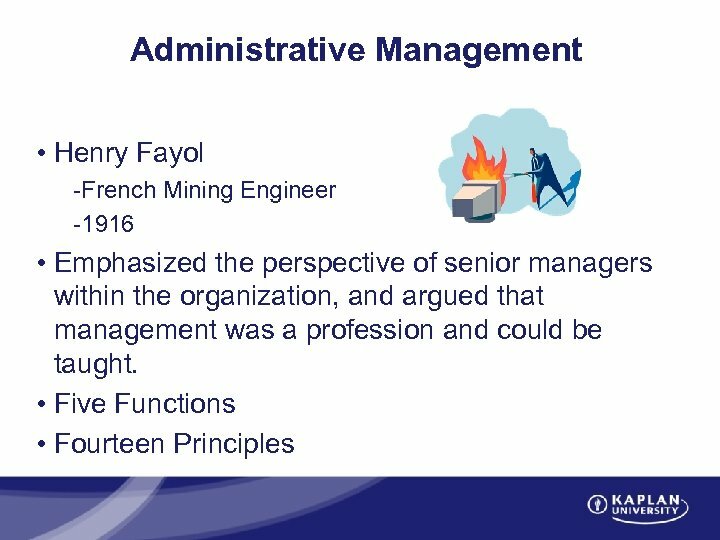 Includes: • Governments (Government actions, rules, laws, regulations, etc. ) • Economic Conditions (Amount of money, interest rates, etc. ) 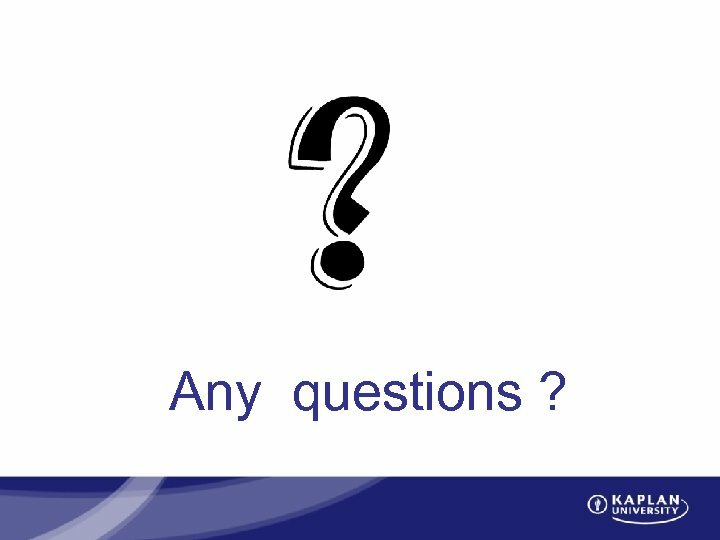 • Technology • Demographics • Social Values • Other fundamental conditions that could affect the firm. 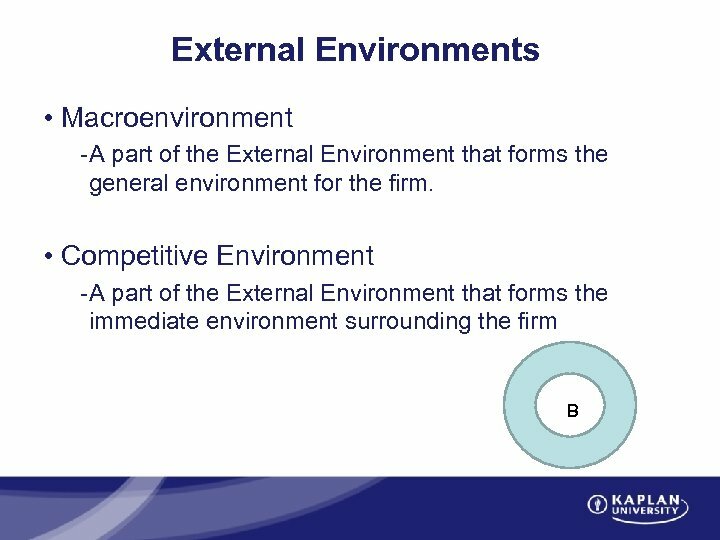 Competitive Environment • A part of the External Environment that forms the immediate environment surrounding the firm. 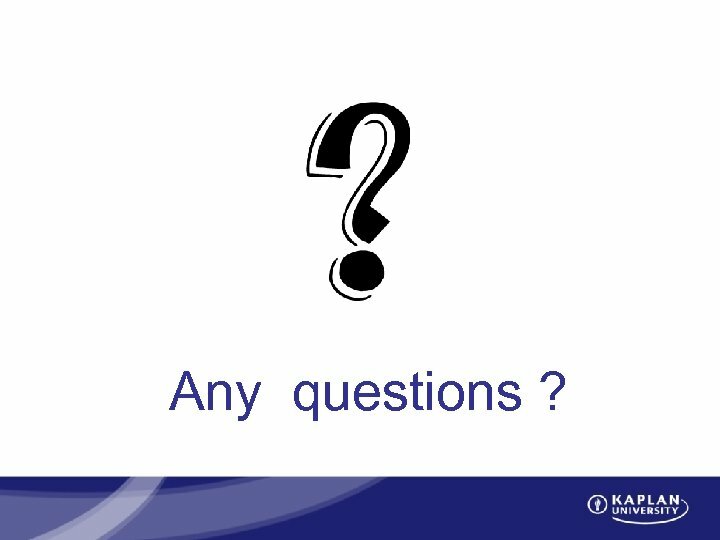 Includes: • Customers: Current customers as well as potential customers. 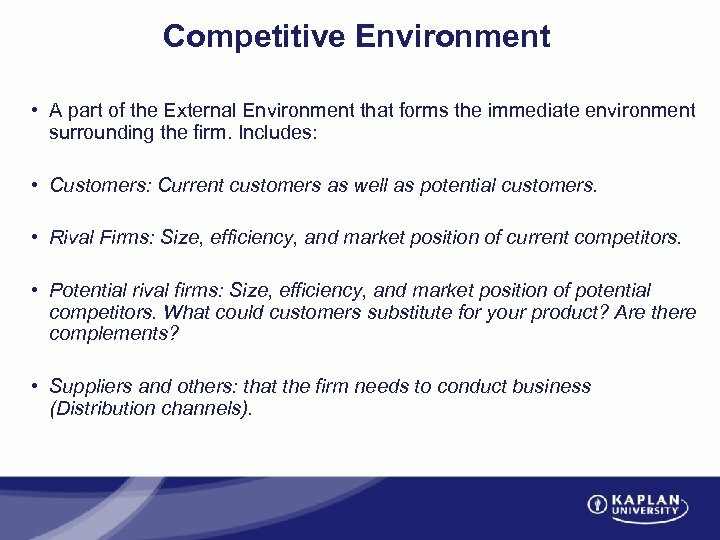 • Rival Firms: Size, efficiency, and market position of current competitors. • Potential rival firms: Size, efficiency, and market position of potential competitors. 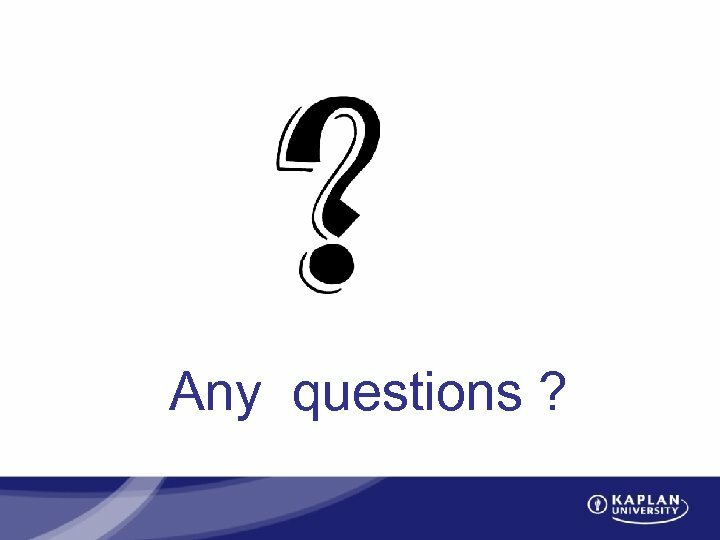 What could customers substitute for your product? Are there complements? 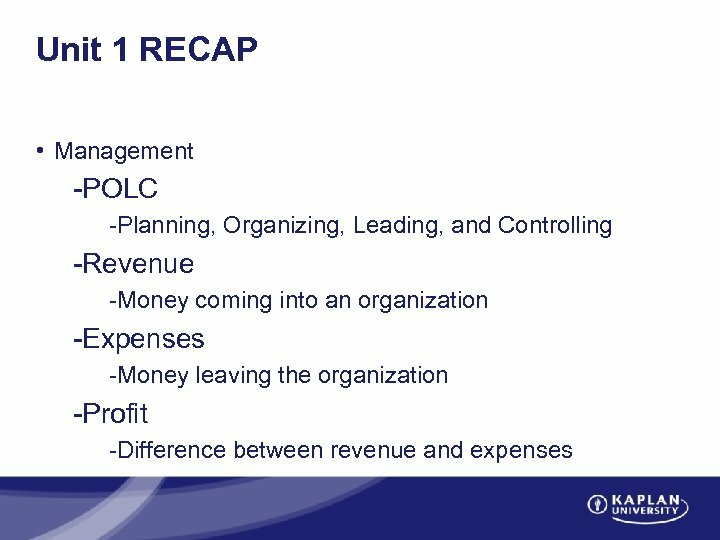 • Suppliers and others: that the firm needs to conduct business (Distribution channels). 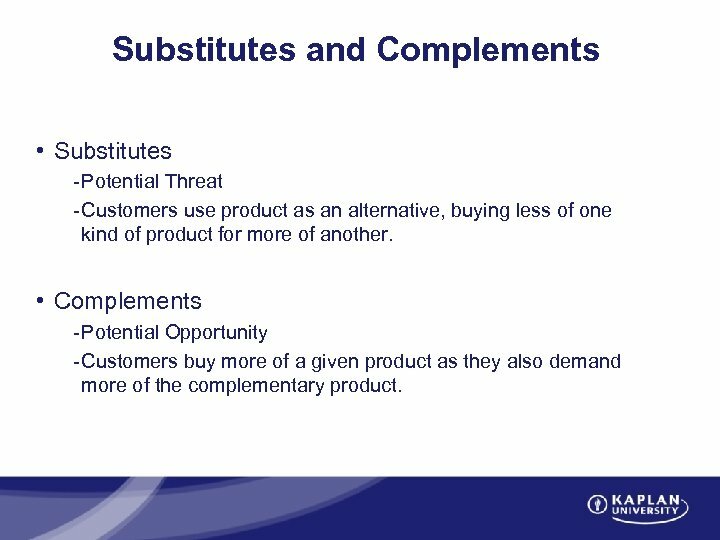 Substitutes and Complements • Substitutes - Potential Threat - Customers use product as an alternative, buying less of one kind of product for more of another. 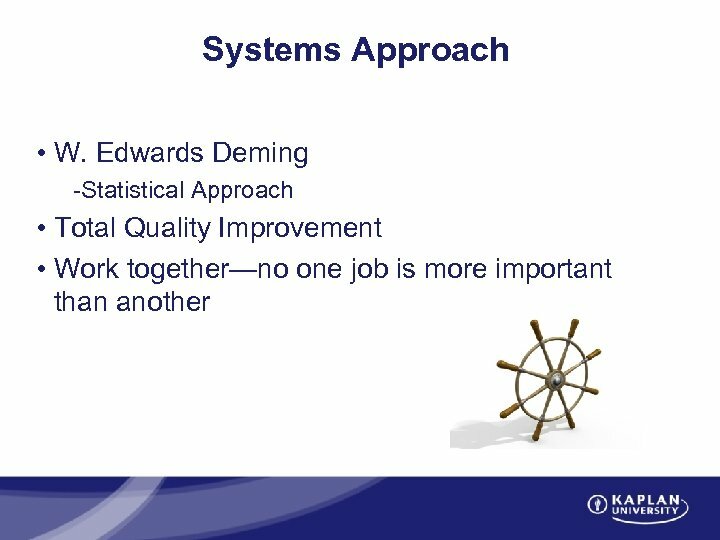 • Complements - Potential Opportunity - Customers buy more of a given product as they also demand more of the complementary product. 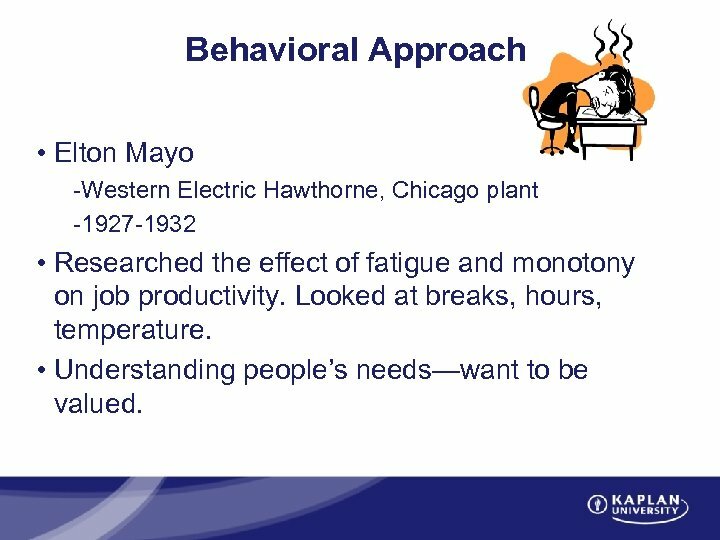 Behavioral Approach • Elton Mayo -Western Electric Hawthorne, Chicago plant -1927 -1932 • Researched the effect of fatigue and monotony on job productivity. Looked at breaks, hours, temperature. • Understanding people’s needs—want to be valued. 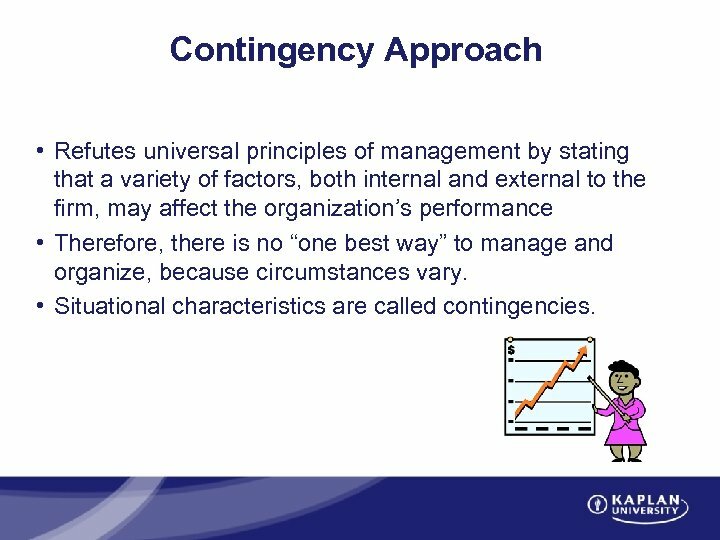 Contingency Approach • Refutes universal principles of management by stating that a variety of factors, both internal and external to the firm, may affect the organization’s performance • Therefore, there is no “one best way” to manage and organize, because circumstances vary. 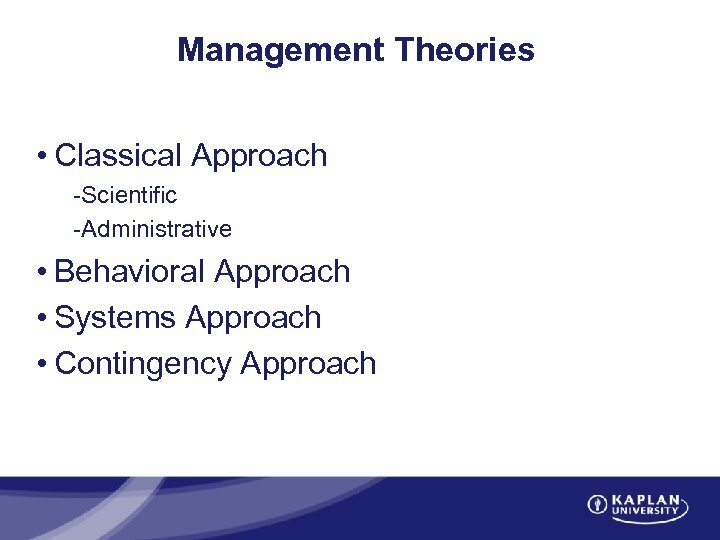 • Situational characteristics are called contingencies. See you next week! 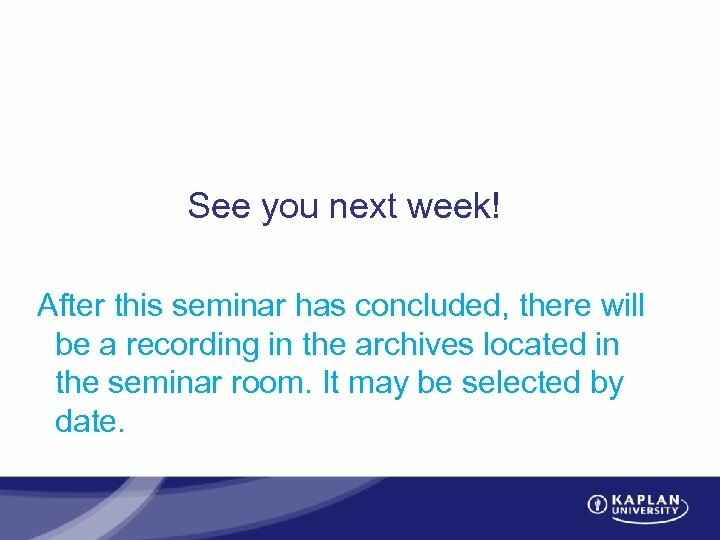 After this seminar has concluded, there will be a recording in the archives located in the seminar room. It may be selected by date. Thank You for Joining Me This Evening! Good Night All!